Is there a part of your garden that just has you mesmerized right now? I always like the front of my house best around this time of year when this bed of tulips starts to bloom. This first picture is how the tulips looked three days ago. I think it helps to announce for anyone not paying attention that "Spring Has Arrived". I took another picture of the tulips the day before yesterday. I can't seem to stop taking pictures of these tulips. I took that one in the evening, when it was cloudy. It started raining about 30 minutes later. Then I took another picture this morning, right before I left for work. The tulips were all closed up, not quite awake yet. By the time I got home the tulips were all opened up and soaking up the sun. I've contemplated a permanent planting in this bed, but then I wouldn't have these tulips to mesmerize me and announce to the world that spring has arrived. I wouldn't have neighbors drive by and holler out "gorgeous flowers". How do I get such a big display of tulips each year? By treating these as annual flowers. Yes, that's right. Once these are done blooming, I'll pull them out and put something else here for the summer. Then in the fall, I'll plant all new tulip bulbs in this bed. It only takes a few hours, and I think it is well worth the effort. Um, yes, I have in the past just tossed these spent tulips into the compost bin, but this year, I might plant them out in other spots and see how they come back next fall. Somehow, it seems less wasteful to do that. Don't forget the Hoe Down coming on May 3rd! Is everyone cleaning up their hoes and other garden tools for the virtual social event of spring? I am! Tomorrow morning, I’m getting all my hoes out, cleaning them up, and taking their pictures for the upcoming Garden Bloggers’ Hoe Down. There will be group hoe photos, posed hoe photos, hoe portraits, hoe action shots, all kinds of hoe pictures. I might even include some of the rakes. Do you think the neighbors will notice all the hoes in my backyard? And me taking pictures of them? I guess if they do, I’ll invite them to bring their hoes over and join in the fun. I hope you aren’t shy about taking pictures of your hoes in preparation for this one time only Garden Bloggers Hoe Down taking place on Saturday May 3rd. It’s easy to participate. Just take pictures of your hoes (or rakes or shovels), and post them on your blog on Saturday, May 3rd. Then leave a comment on my Hoe Down post so we can find you and come visit your blog and see all your hoes (or rakes or shovels). That’s all there is to it. And to answer the most popular question in advance... if you don't have a hoe, any garden tool will do. It ought to be a good time, so don’t miss out! Wow..lovely tulip bed. I may try to dug and replant mode one day. I do love the sight of a full bed of tulips! Glad you reminded me about the hoe down! I'll see what I can "dig" up. lol! Fantastic flower bed, Carol! I used to keep the garden at our church and this is what I did every year with the bulbs. It does make for a stunning display. I don't have any beds dedicated to a big annual display like yours, Carol, but your lovely tulips certainly make a compelling case. What do you put in there for the summer and fall? And is it left empty in the winter? I would just sit and gaze at those tulips for hours, they are spellbinding. I don't have the stomach to dig mine up, but your bed looks so good, maybe I should do that as well. And replant. Thanks for the reminder about the hoe down, ideas are swirling. Your tulip display is just great. I don't blame you for wanting to sit and stare at them, soaking up every minute they are showing their lovely blooms. It will be interesting to see what goes into this bed after the tulips. They will be a hard act to follow. 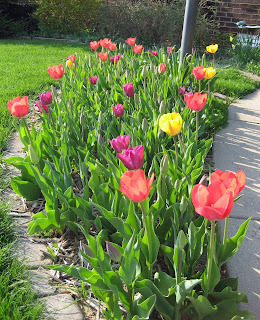 Carol, your tulip bed is gorgeous! 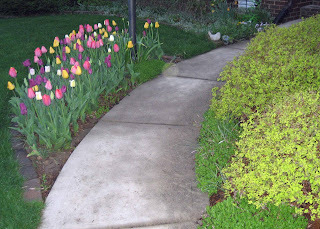 In my last house I had a lot of tulips in the garden that lined my driveway. I lived there five years, and they always came back and bloomed each year. I drive past the old place often, since it's on my way to other places, and those tulips still bloom. I think it's worth transplanting them. Some tulip varieties seem to rebloom better than others. Those tulips are gorgeous, Carol. I collect the discarded bulbs at the garden center and plant them in my garden. I must have 300 bulbs now from our Spring displays that I have to prep. I am passing along the E for excellent blog award to you so come on over and collect it . Tulip bed is fantastic. I love all the spring colors mixed together. It really does shout "Sping is here." 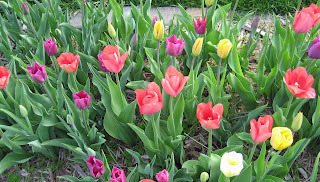 Your tulips look wonderful, like a basket of colored Easter eggs. They have such a springy look to them, whereas here, we're about to turn the corner to the long hot days of summer. Carol, your tulips are gorgeous! So, do you think we'll get a light freeze? I sure hope not! The tulips are fabulous. 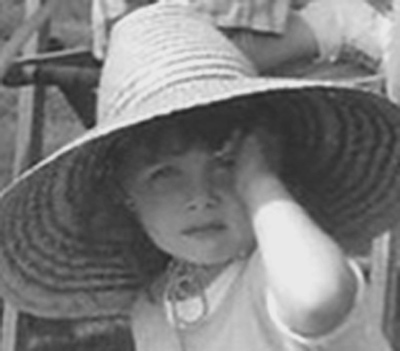 I remember having some of those in another life! Now I have to make do with narcissus which seem to do well down here. I tis tough to get through the long lanky foliage phase so I don't blame you doing the annual treatment. I wonder what they do at the Botanic gardens? I'll bet the same thing. Those tulips are just amazing! Good job! The tulip bed looks lovely! 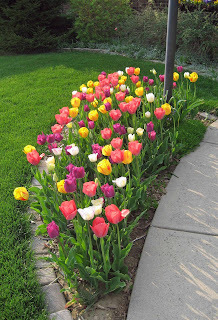 I am thinking of doing the same thing with my tulips....they will be a great big mess of leaves in a few days and this way I can plant them in a less noticeable spot. WOW! If I had those tulips I'd be taking endless pictures too. I never dig mine up, they come back every year. I have perrenials that fill in the space once the tulips have quit blooming. Color me amazed. Your tulips look just like a photo shoot from a Dutch Gardens catalog. I'm already thinking where I'll plant them...definitely in the front. beautiful tulips. I'm a newbie gardener and grew tulips for the first time this year. I can't stop taking pictures, too. Anyway. Can I just let my tulips dry out and wait for them to come out next year? Carol, maybe this rambling comment would be interesting to someone? I spent a few years as a horticultural volunteer at a park that put on large annual tulip displays. 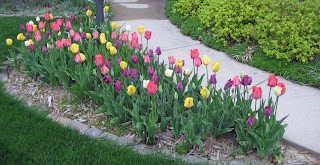 One of our jobs was to dig out the tulips a few weeks after they bloomed so annuals could be put in. We stacked the pulled bulbs and park visitors frequently took them home to try to get them to rebloom. I tried it myself, partly because there were varieties not generally available. My best results came from packing the pulled plants upright and close together in those black plastic pots that small trees and large shrubs come in. They had maybe 4 inches of soil under them, then were filled in with more soil a few inches higher than they'd originally been planted. The potting soil had extra perlite and compost added with a sprinkle of time release fertilizer on top. I stuck the pots in semi-shade around the corner of the house and left them...watering once in a while. The tulip leaves and stems stayed green for some time, finally withering and disappearing. In fall I tipped out the pots, planted the bulbs where I wanted them and was pleased to see most of them bloom the following spring. It was fun to recycle them! Wow and magnificent. I applaud your planting. Toook the hoe pictures last night. Your photos are gorgeous. I'm feeling mesmerized these days, too. I rush home each day and take pictures like a fool in love. Funny how the simple pleasures in life are the best ones. Thanks for sharing your shots!